The following article was written by Ted Zettel. 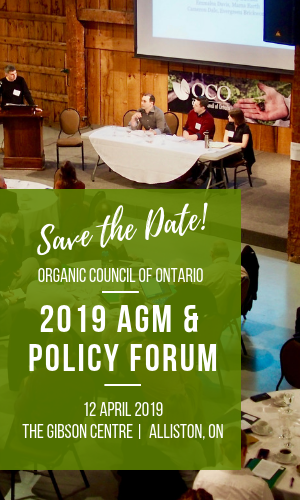 Ted sits on OCO’s Board of Directors and is the current Chair of the Organic Federation of Canada. He also has an organic farm in Bruce County, Ontario. In the following article he tackles three widespread criticisms of organic food and farming: that organic food is no more nutritious so thus not worth the extra cost, that even organic food has toxins and that the Canadian Regulatory system for organic farming and processing is full of loopholes. “Unlike the rest of agriculture, we can only gain from openness and honesty,” he states, speaking on behalf of the Canadian organic sector. After enjoying fantastic growth and generally positive press for several decades since its emergence as a widely known option in the marketplace, organic food has taken some mean criticism over the past year. The immediate reaction of those of us who grow, process and sell these products was one of indignation and alarm. How can anyone say such things? Organic food not better for you? Not pure as the driven snow? These are intolerable lies! Now that the dust has settled, the sensational headlines faded into journalistic archives, and our emotions subsided, it would be good to look carefully at the substance of the claims knocking the organic sector, and what, if anything they can teach us. Are there pieces of the system regulating the use of the word “organic” that need to be strengthened? We know there are. Is there widespread misunderstanding in the public mind about what we are claiming when we stick on the organic label? We know that there is. A wise man once said “In every criticism, find the kernel of truth – and swallow it”. After we have calmly reasoned our way through this analysis, and are clear on the real value we bring to consumers, the organic sector can use the publicity generated by future attacks to tell our story more effectively. This is not new by any stretch of the imagination. In fact, you could say that this statement represents the mainstream scientific consensus from the beginning and persists today even in the face of mounting evidence to the contrary. The theory, simply stated, is something like this: food is food. Corn is corn, beef is beef, milk is milk and beans are beans. Period. How you grow your plants; whether you use herbicide or pull weeds, fertilize out of a bag or use compost, grow diverse crops in sequence or practice monoculture, has little to do with nutrition. It’s all the same as far as the eater goes – just follow the Canada Food Guide, and be assured that the government regulates what farmers do to ensure that our food is the best in the world. Pesticide levels are so low that they do no harm. It can’t get any better, so as far as your health is concerned, there is no value in paying more for something that is grown organically. there is not a connection – reductionist science has it right. I have never had a taker for defending the second presumption. Ironically this flawed view of nature, born in the post-war glory of technology where science was the new messiah, which reduces systems to their smallest constituent parts and then considers each piece in isolation from the whole, hangs on only in a few fields where the commercial interests dependent on suppressing a wholistic approach are very powerful. Agriculture and Medicine are two biggies. But in regard to both, I would argue, and my experience confirms, the modern psyche has grown out of a simplistically naïve acceptance of technology and recovered at least some of the ancients’ humility before an awesome creation that we are just beginning to understand. To be less confident that our ever increasing manipulation of nature is benign, and more ready to learn from and model on what we observe in the processes of nature is an attitude organic advocates can spread to the benefit of all. When we describe our value proposition in these terms we go far beyond the pedestrian debate over levels of calcium or phosphorus on which the criticism was based. We need more organic farmers telling their inspiring stories of discovery about the connectedness of all living thing, stories which resonate with something deep down, waiting to be awakened – an intuitive truth. Science delving into living things is steadily vindicating the wholistic approach. I will give just one example – that of grazing for animals and the benefits for the eater of milk, meat and eggs. Organic farmers have always demanded that animals go outside and eat grass –Why? Because that’s the way it was meant to be! 30 years ago we knew nothing of the intricacies of Omega acids in food or their effect on humans, let alone the variances depending on how the animals eat. Lo and Behold… as the science has developed we now find out that grazing animals produce just the right balance, far superior for keeping us healthy, than animals in total confinement. Isn’t that interesting. Nature had it right! Everything is connected. It’s true. Sadly but realistically we must state that organic farms do not operate under plastic bubbles, immune to the pollution of the outside world. We share the air and water with an agricultural community that spews out millions of tons of toxins into the countryside as part of the regular, everyday, legal farming practice. Even though we operate without any of these biocides, and put in place buffer strips to minimize contamination from outside, small amounts drift in and can end up on organic food. Since we have always lived with this reality, the organic community has never claimed to be able to produce food that is completely pesticide free. What we do guarantee is that we don’t use the substances that are prohibited under the Organic Standard, which includes all chemical herbicides, fungicides, insecticides, along with chemical fertilizers and genetically modified plants. The fact that we don’t apply toxins directly on the farm, and that the rules for processing food after it leaves the farm stop a host of adulterations and additives that are the norm in the food industry, result in a greatly reduced risk of exposure for consumers. Many studies have reached this conclusion, and for most reasonable people, it is an understandable and acceptable explanation. But I think we always need to emphasize that the primary health benefit is more likely in what the food does contain, grown out of a wholesome environment, than the toxins we have managed to avoid. And doesn’t knowing that it is virtually impossible to keep anything toxin free because of the widespread use of agricultural chemicals make you want all farms to be organic? In Canada, we are less than 4 years into the implementation of the “Organic Product Regulation”, which is our first attempt to legally codify and enshrine in legislation the use of the word “organic”. Before that, the industry had voluntary standards, without the force of law to back them up. The 4000 or so operators who have had their farms or processing facilities evaluated and certified as compliant with the Standard since 2009, know that under the new law it is not easy. There is a great deal of record keeping involved. The rules cover a multitude of management areas; soil health and fertility, crop rotation, animal husbandry, housing and handling and storage of products to name only a few. The visit by the organic inspector which occurs at least annually, but more frequently if needed, requires many hours of preparation, and is stringent and onerous enough that we know some farmers who follow the organic rules choose not to certify because they can’t handle the hassle. Could someone cheat and get away with it – pretend to be organic and fudge the paperwork? Most likely the answer is yes – theoretically at least – but in the real world, I think deliberate criminals will most likely be drawn into more lucrative trades. But imperfection is a feature of every regime of regulatory activity. Think of traffic laws or income tax laws or municipal bylaws; all of these are imperfectly policed, and some people (a small minority) break them. Out of this small group some get caught and the penalties serve as an incentive for the majority who will do their best to abide by the rules of any legitimate authority. A few will get away with it and have to wait for their fair recompense in the great beyond. But we can be confident that for the most part, while it is not perfect, the organic certification system does what it is supposed to do – it ensures that those who use the label follow the rules. Since most of the organic food is purchased in retail stores which demand certification, buyers are getting what they’ve paid for. What is still troubling is the number of uncertified operators, who seem to be increasing in numbers. Because of the lack of provincial legislation outside of Quebec and BC, these producers – who usually sell direct to their consumers – can still get away with using the Organic label with no certification and no third party verification. While it is small in terms of dollar value and includes some many goods that are grown following organic principles, this unregulated group is most at risk to misrepresent the brand and damage the credibility of the entire sector. So we must continue to work to close the “intra-provincial regulatory gap”. As people who grow, handle and sell organic food, we can be confident that what we do provides real value to the people we serve. We should be ready with answers when criticism comes. Unlike the rest of agriculture, we can only gain from openness and honesty. The more knowledgeable our consumers become, the more deeply they understand the science and methodology behind our claim, the more firmly supportive they become. There are other criticisms out there, like the idea that organic farmers could never feed the world, but that will take another article.